2. In a small bowl, make the brownie mix according to directions on package. Pour into pan and bake for about 7-10 minutes until just set. 3. Melt the caramels with the evaporated milk over low heat in a heavy saucepan. Stir often, and heat until mixture has a smooth consistency. 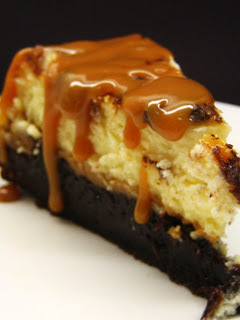 Reserve 1/3 cup of this caramel mixture, and pour the remainder over the warm, baked brownie crust. 4. In a large bowl, beat the cream cheese, sugar and vanilla with an electric mixer until smooth. Add eggs one at a time, beating well after each addition. Pour cream cheese mixture over caramel mixture. Place cheesecake in a waterbath and put it into the oven. 5. Bake cheesecake for 50-60 minutes, or until just set. Turn off oven and leave cheesecake inside until oven has cooled. Take cheesecake out and refridgerate. When cake is thoroughly chilled, loosen by running a knife around the edge, and then remove the rim of the pan. Heat reserved caramel mixture, and spoon over cheesecake. I made this today. I followed the recipe exactly and the brownie bottom didn’t cook through. It just didn’t turn out. So sad!